While the thin client computing model has never taken off to the extent that some proponents hoped it would, it has found a niche in some markets and Hewlett-Packard Co. has two new models – one for stationary or desktop use and one for mobile use – for businesses that use this computing model. A thin client is typically just a box with little storage or processing power; it relies on a server in the data centre – often a virtual machine – to provide the computing power and serve up the desktop and applications. A monitor, desktop and mouse can be connected for the full computing experience. Thin clients have found use in markets such as call centres, schools and libraries and kiosks. 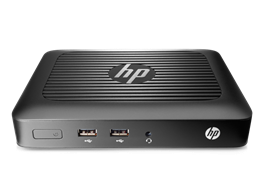 HP has announced two new thin clients: the HP t420 for task workers in call centre, desktop-as-a-service and remote kiosk environments, and the HP mt245 Mobile Thin Client for cloud computing on the go in a laptop form factor. The HP t420 comes with a choice of operating systems, including Linux-based HP Smart Zero Core and HP ThinPro, and Windows Embedded 7. It also includes value-added HP software, integrated browsers, and support for voice-over-IP with Microsoft Lync and unified communications tools. It features flash memory storage and a fan-less design for quieter operation in a 5x7x1-inch container. The t420 can be attached to the back of a display or bundled with a display and HP Integrated Work Center Stand. Both Gigabit Ethernet and Wi-Fi are supported, and it comes with a business-class USB keyboard and mouse. It will be available in July, starting at US$239. 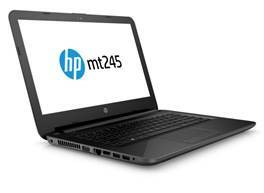 The new laptop-like thin client option from HP is the HP mt245 Mobile Thin Client. Like the t420, it’s a commercial-class device designed for business users, but in a more mobile form factor that, like a laptop, features an integrated display, keyboard and mouse. The mt245 features Windows Embedded Standard 7E tools, programs, and resources in a laptop form factor with a 14-inch diagonal HD screen. Security features prevent exposure to unwarranted outlets, and Windows with Write Filter ensures unauthorized updates and viruses are locked out. The HP mt245 will be available in July.